Yesterday was my 54th birthday. Being a Thanksgiving baby, like Christmas babies, my birthday usually gets lost in the holiday so I have learned never to expect much. The plus side is that family is always around when it's my birthday because they have to be...it's Thanksgiving. But the birthday celebration itself usually becomes a part of the Thanksgiving feast rather than a separate party. Although, I did have my "big" birthdays remembered in a special way...you know "Sweet 16", "40", and "50". This birthday was a normal one. My husband had the week off. Normally we would have taken a vacation but thanks to the "Affordable Health Care Act" (that will hopefully be "Repealed and Replaced" next year) we were surprisingly stuck with thousands of dollars of medical bills and had to cancel two vacations as a result of it. So in place of a vacation, we went to Chicago for a few days to visit our children and then spent the rest of the week at home with Ashley and Jason (Jordan had to stay behind in Chicago because of work). We decided to take our kitty to Chicago so that Jordan could spend some time with him; he hadn't seen him since we brought him home from the shelter. I was so worried that he wouldn't be able to handle the six hour car drive, but he did surprisingly well. He spent part of the drive in his little carrier, but most of the trip he spent sitting on my lap. Below is a picture I posted on Instagram. The picture on the left is my son-in-law Jason. We were playing a game of Aggravation and my kitten Jackson was just enamored watching us roll the dice. The top picture on the right is my son Jordan napping after church. Jackson jumped on his lap while he was sleeping. And the bottom right picture is Jackson in his carrier in our car. Well, by now your probably all wondering what I got for my birthday. My husband bought me a pair of burgundy booties for my birthday earlier when we were out shopping. I've shown them to you before HERE. 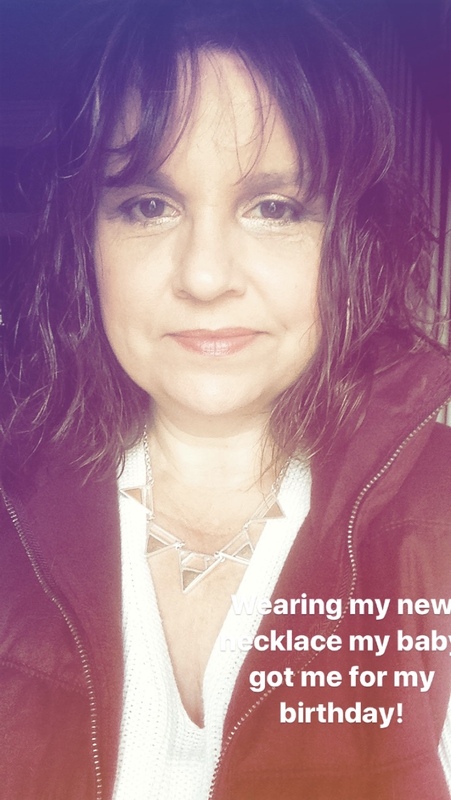 My daughter got me a fantastic metallic gold handbag and a modern geometric necklace. I'll show you the bag in a future fashion post, but the necklace is pictured below. Jackson was so excited to see my present. He thought the gift was for him! He loved peeking in the bag and seeing what was inside. 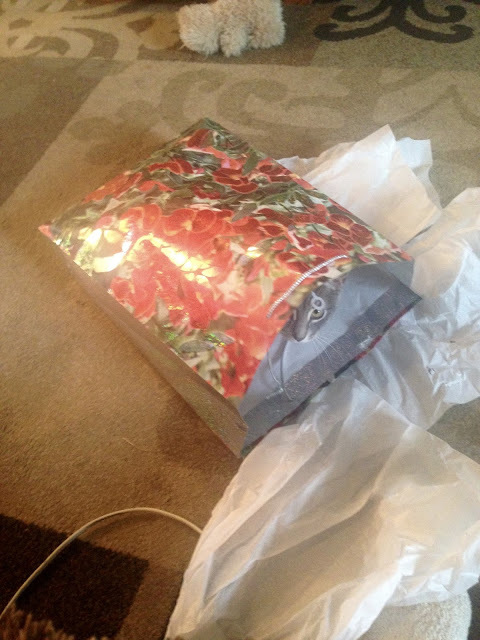 And of course the bag and tissue paper became a toy once the present was removed. If you follow me on Instagram you may have seen this picture on Instastories. This is the necklace my daughter bought me. I absolutely LOVE it! Since my birthday was on a work day, we celebrated on a Sunday. By now all the kids went home, so it was just my husband and I. We went to church, out to my favorite Mexican restaurant for lunch, shopping, and a movie. We bought a few Christmas presents for the kids and Jackson, and walked around a store's displays of Christmas trees. 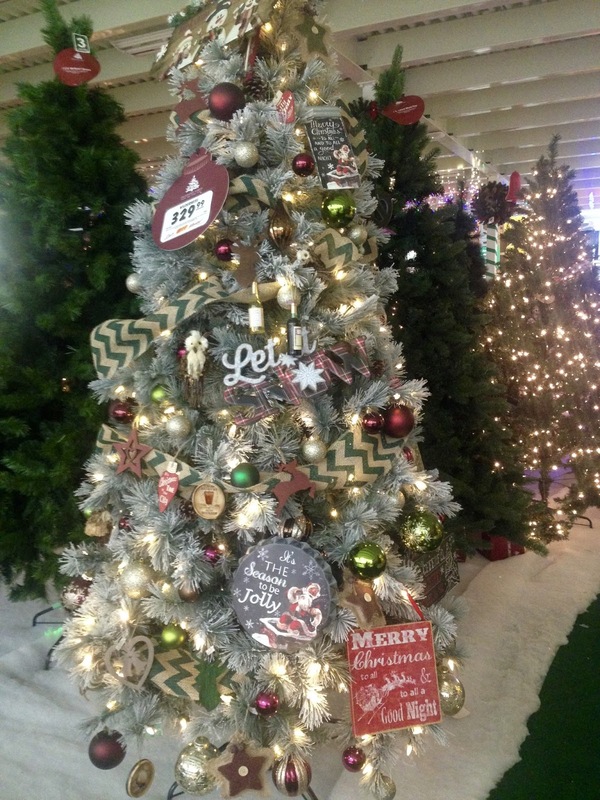 I absolutely loved this flocked country-themed tree. I've been debating whether or not to even put up Christmas decorations this year with a new kitty in the house. He gets into everything! The kids will be so disappointed if I don't, but I seriously don't know if it's worth the trouble. 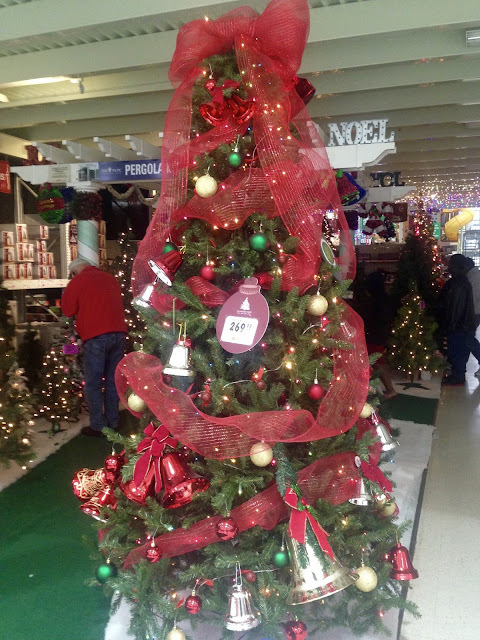 When I saw this tree, it gave me a little bit of hope. Perhaps if I use bigger ornaments like this on our tree, Jackson will not be nearly as destructive. And now for the Birthday RAKS. "What is a RAK?" 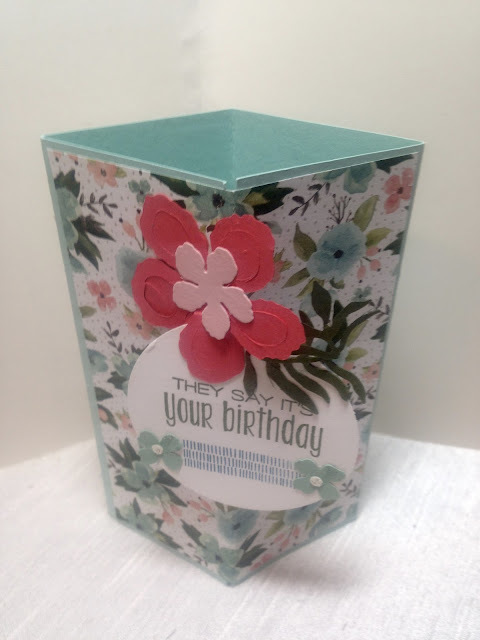 some of you non-paper-crafters might ask. It stands for "Random Acts Of Kindness". 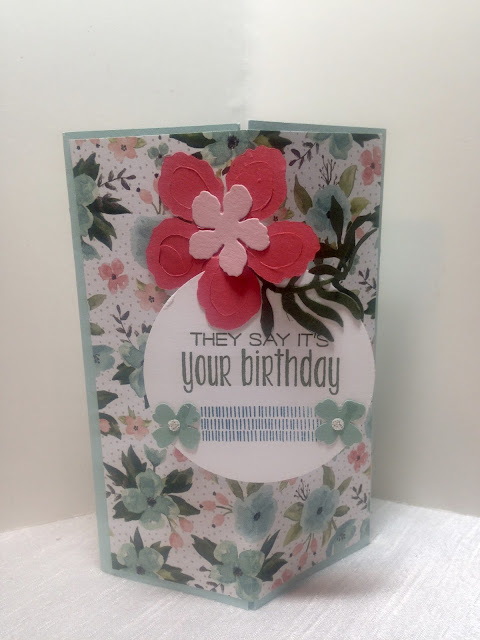 I belong to a on-line paper-crafting community called Splitcoaststampers and one of the nice things they do is send hand-made birthday cards to their members. This year I was lucky enough to receive four of them. 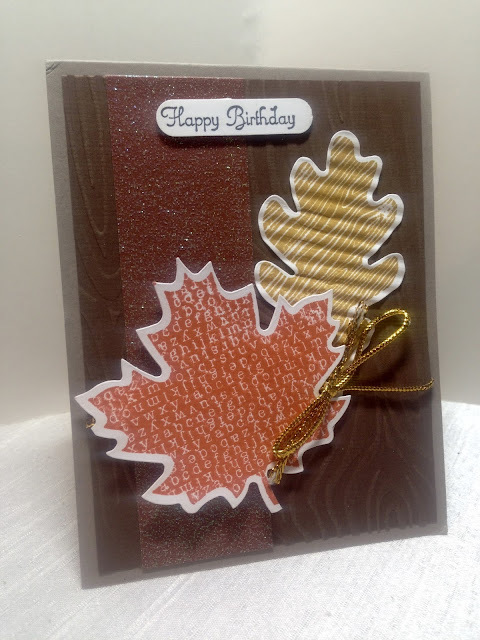 My first one is a fall-themed birthday card from Annehem715. 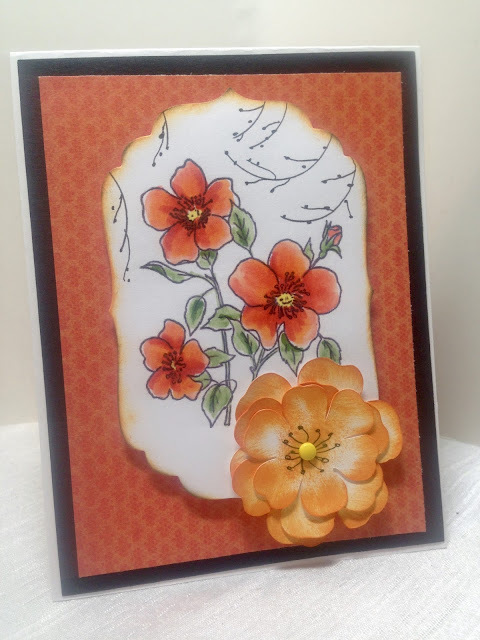 I love the fun leaves and the glittered panel. 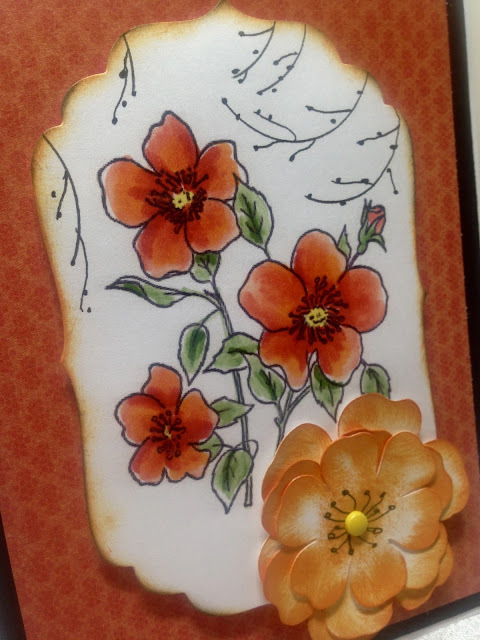 This unique card stands up and the birthday greeting pops out. It's from 2Cute Cats. 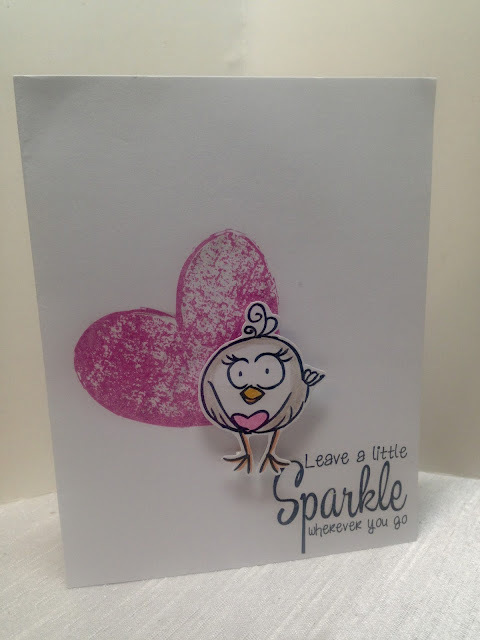 I absolutely adored this cute birdie card from Anniepanda. 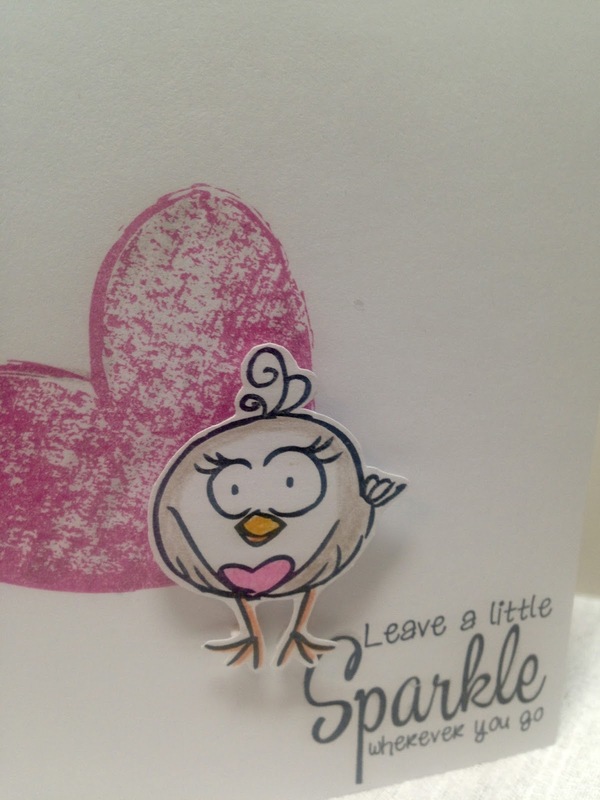 The cute birdie is popped up on dimensionals. And finally, I love the floral card from Annsforte3. Isn't it beautiful? All-in-all it was another wonderful birthday. My daughter surprised me and left me the most wonderful birthday tribute on Facebook. I was so shocked, because we as a family do not usually display our affection publicly that way...but it certainly made my day! Every day I am filled with gratitude over the wonderful little family I have. I may not have a great, close, extended family, nor a lot of friends, but I have the best nuclear family anyone could ever ask for. Happy birthday Amy. Wishing you many blessings in the coming year. Sounds like a nice weekend! Funny thing I think I have a necklace that looks just like that and I love it! Thanks Ruth! I love the necklace! It's so versatile! Happy belated birthday, friend. Sounds like you had a very special celebration with those who love you most. I say put up the decorations! Our kittens were really good. A few casualties among the bulbs but only cheap ones. Thanks Leslie! I actually started putting up the decorations and my kitty had the time of his life with all his excitement. I've already had to pick up a few things he knocked onto the floor...but I'll manage. He's certainly enjoying it! Sounds like you had a lovely birthday celebration. Mexican would be my choice too! I would put up your decorations, but definitely secure your tree! We would always tie it up to way ever was near by. Also, maybe not put on your most precious, delicate ornaments this year! Yes, it was a nice birthday. And Mexican and Italian are my two favorite foods! I did start putting up decorations and Jackson has been loving every minute of it. He is so excited that even though he messes things up a bit, it's worth it to see his joy. It's like having small children in the house again! Yes Elli, I was worried Jackson wouldn't handle the trip well either because he stresses out just going to the vet. But he did settle down after awhile.